The Daylight Centre Fellowship (DCF) is an independent local charity. They strive to help the people of Wellingborough and the surrounding districts in meeting personal challenges that range from mental health issues, drug and alcohol abuse, learning difficulties, to homelessness or just feeling fragile, isolated and alone. They provide an important level of support within our local community. They help to fill some of the gaps in time and space, offering the time to talk and be listened to and a space that is welcoming, clean, comfortable, inexpensive and non-judgemental. 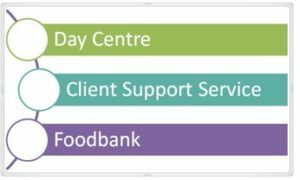 The Centre also offers a Foodbank, which is a core service for those who need it. We have a donation box for the Foodbank in our church making it easy for members to pop items in to donate. The Daylight Centre’s vision is that all members of our society will be valued, and know they are valued, and are able to access the support and services they need to achieve this. Jane Bell is our Daylight Centre representative in the church. Their mission is to offer time, space and practical guidance to people that enables them to tackle the problems that limit their quality of life. 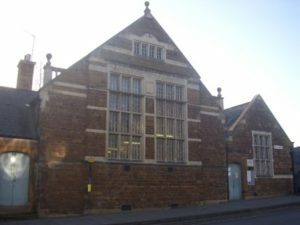 2018 was very eventful with a new roof and redecoration of Queens hall, this has provided a much improved environment for the services they provide. The number of people using the Daylight Centre has remained fairly constant, but the demand for free meals to people in need has increased dramatically. This is also reflected in demand upon the Food bank which showed a 17% increase in demand over the previous year. They have had the greatest amount ever donated over Harvest and Christmas. This has caused some logistical problems with sorting and storage, but they are starting to resolve this. The recent request list is minimal due to the donations. The regular monthly financial donation along with other similar gifts has improved our cash flow, and we are in a stronger position than this time last year. Our new charity shop has been successful, but please pray that we will find suitable alternative premises and an affordable rent. The Welcome and Befriending team are also working hard, supporting those in need. It’s important to remember that just making that first step through the door is a big deal for many of them. Over 2019 the centre would like to employ another member of staff and we are also awaiting the result of several funding appeals, which will strengthen the team and allow Paul, Daylight Centre Manager, to take a more strategic role. Please keep the team, staff and volunteers in your prayers for good health and energy. Pray that we receive more financial resources to develop our services. Pray for the trustees for God’s guidance and wisdom.